the bride's cafe has a wonderful three part post about an absolutely adorable picnic wedding. here is a quick preview of the invitation suite. it is such a wonderful example of event stationery done well. 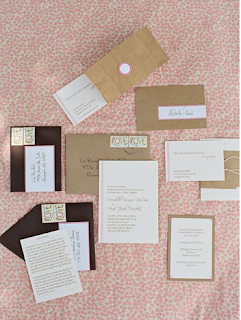 be sure to check out the rest of the posts, there is such a wonderful connection throughout the wedding, starting with the paper goods. it really is important to set your tone/theme and then carry it through the entire event. i haven't seen such a wonderful example in a while. Wow. It's a great skills to make this wedding papers and no, not just skill a great talent in arts.